Cheap gifts don't have to mean bad gifts. When there are so many events and functions where return gifts have to be given, being budget conscious is a sensible idea. 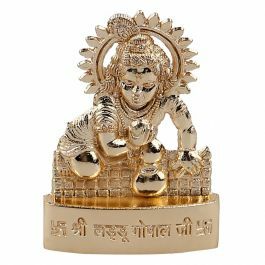 And when there are so many great options for small, interesting yet low priced return gifts available online in India, you need not worry about leaving a dent in your wallet or guests disappointed. Let BP-Guide India show you the best low price return gifts for any kind of party or celebration. 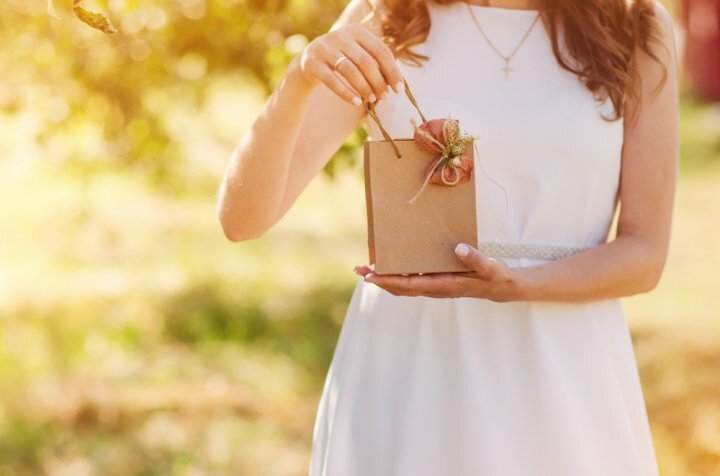 Whether it is a birthday party, a festival or your anniversary, hosts giving guests gifts in return has become a norm nowadays. The gesture of sending guests back home with a present is that it is not only a way of thanking them tangibly for making the time to be a part of the celebration or event but also to make them happy by giving a thoughtful gift. 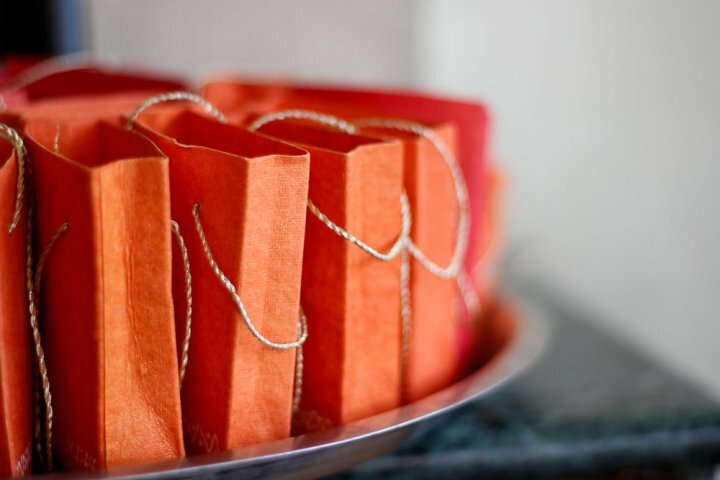 To organise a party or a function is a difficult and time-consuming task in itself, selecting return gifts for everyone makes it even more hectic. However, it is well worth the effort since your guests will leave with a smile. 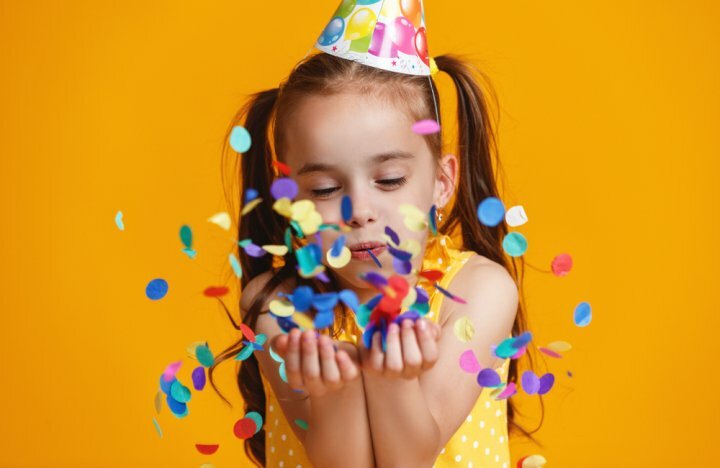 Especially if you are hosting a party for little ones, then your gifts will be received with excitement and joy. Remember to make the whole experience a fun one. Put some thought into the gift as it reflects on you as well. Pack up the gift neatly in either a bag or wrapping paper to ensure it looks good. While handing out to them remember to thank them warmly. Your guests will surely love your special care and of course, your thoughtfulness. 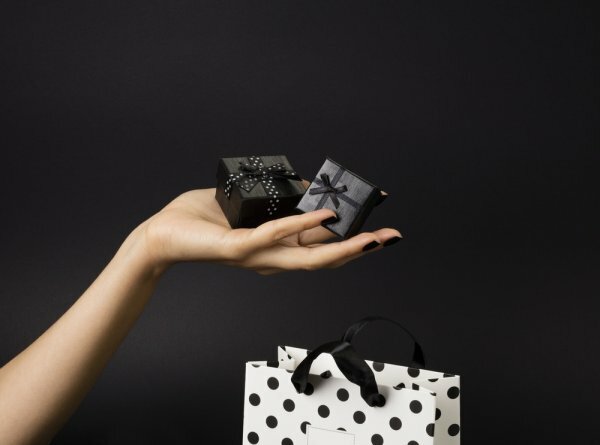 Buying return gifts is not an easy task. After all, you need to buy a quality gift that does not break the bank and that also is appreciated by the guests. Thankfully there is today a whole lot of choice at all price points but it does need some effort on your part to find the right items. It gets tougher when your budget is tight, but do not worry. Here are a few tips to make things easier for you, even when your budget is as low as Rs. 20 per gift item. Naturally, today the first stop when you are looking for gifts under Rs. 20 is online sites. In addition to giants like Amazon, several websites are dedicated to return gifts so there is no dearth of choice. These websites are frequently updated and have a huge stock so you have lots of option. And of course, the convenience of choosing and ordering with just a few clicks is pretty unbeatable. Nonetheless, don't dismiss shops in your local market. 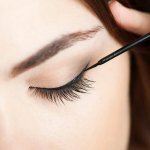 At times, you are likely to find more options at such stores, especially when you are looking for products at lower prices. 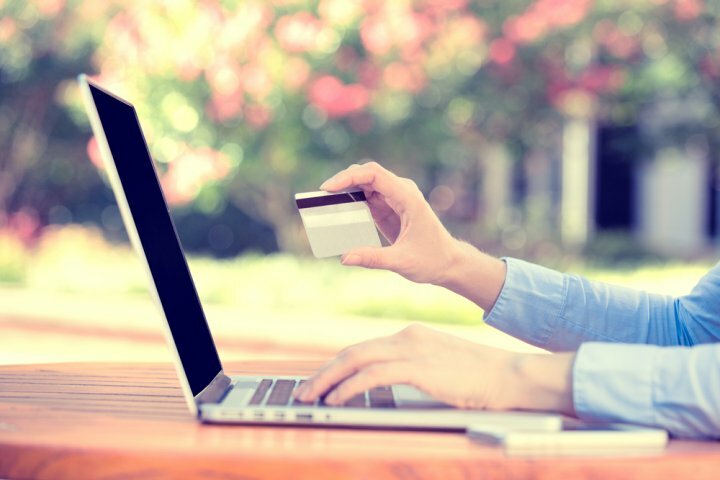 Try looking around online first to get an idea of what's available within your budget. Next, make the time for a trip to the nearest market and check options there. Compare and shortlist for your needs. This approach ensures that you are getting the best value for your money. Purchase in Bulk And Don't Forget To Negotiate! Buying in bulk is pretty much essential for getting return gifts at affordable prices. Estimate the total guests you expect, add a few for buffer and that should give you an idea of how many guests are likely to come for your event. When you buy in large numbers, say 30 to 50 or even 100 items, vendors often are willing to drop prices. This can greatly help you in finding good gift items under Rs.20. But remember, negotiations are mandatory to ensure you get the right price. 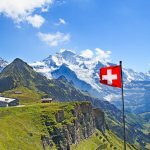 In addition to reducing the base price of the product, try to see what other services the vendor can add for free - can it be delivered for free? 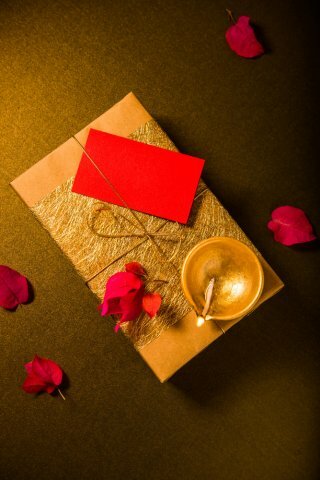 Can the gift wrapping be included in the same price? Can the company add other decorations like ribbons or cards for free? Make sure you ask these questions so you know what you can get for the money you pay. Buying gifts is an art! When you are looking to buy affordable gifts, your skill becomes even more important. One of the things to keep in mind when you have a low budget is to make your gifts unique or quirky even if they are small. This ensures that the gift stands out for the guest. A gift that's not run-of-the-mill will make the guest give it more attention and they are likely to appreciate you all the more! But remember, the one thing you should not compromise is quality. Whatever your gift, make sure it is something that will not embarrass you by falling apart the first day. You may find it difficult to lavish gifts when your budget does not allow you to spend more. This means your gift necessarily becomes a small one. But do not let that stress you. You can take away the focus on the gift by giving out goody bag filled with several small things. For instance, for a kids party, you can have a goody bag that has the gift plus a few candies/chocolate. 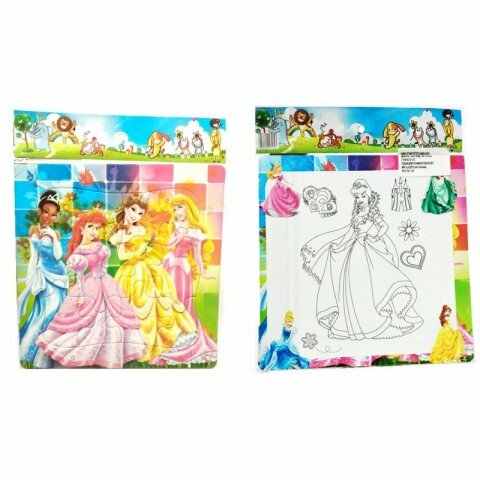 This bag of surprises is sure to keep the kids entertained and happy. 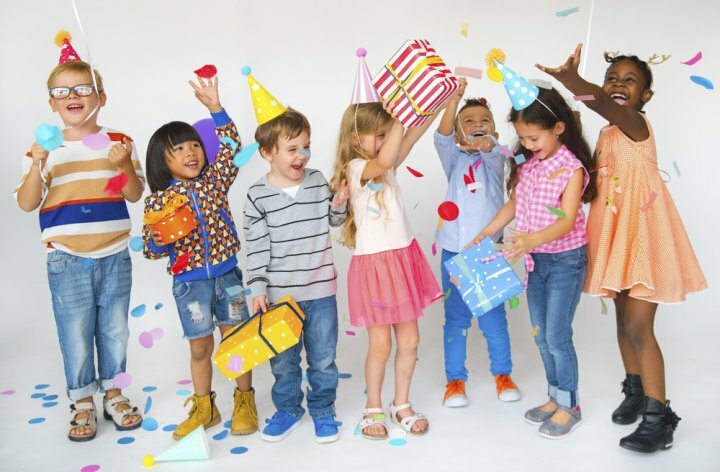 The challenge of finding interesting and affordable return gifts for kids parties is something that parents go through every year. There is always an expectation that the gifts will be new and exciting, and that's why many of the stores constantly introduce new items. So make sure to check out with the shop, whether online or offline, on what is new and trending. After all, you don't want to be the parent who gives out boring gifts! This surely does not mean an expensive gift! In fact, there is a lot of choice between the price range of Rs. 15-25, and we have selected some of the most interesting ones for your consideration. Kids always enjoy smart and cute accessories and this colourful goggle is sure to be a hit with them. Priced at Rs. 20 per piece, the googles is foldable, forming a cute character face when done so. Available in a range of colours, this gift idea is a fun option for both boys and girls. Order it on smalltub.com. The minimum order value for this product is Rs. 299, so you will need to order at least 150 nos. Here is the first option: These colourful pens are priced at Rs. 18 each and have a comfy shape though slightly long. 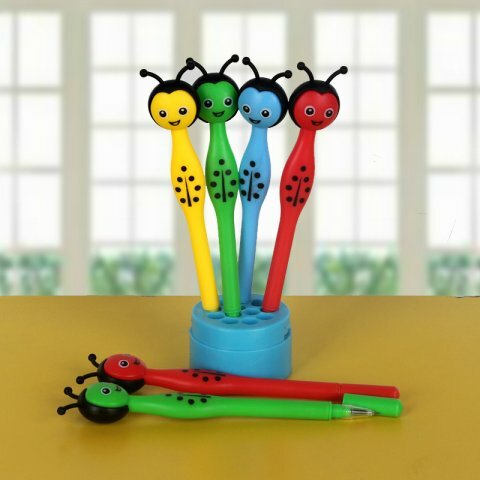 With a cute look, these honey bee pens will be liked by both little boys and girls. Available on smalltub.com. 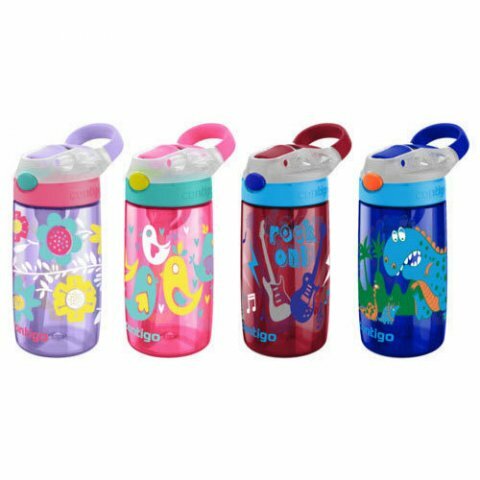 There is a whole of options on the site including pens shaped like dolphins, spinner wheels, ice cream cone etc.,so you can pick ones that will best attract the little ones. 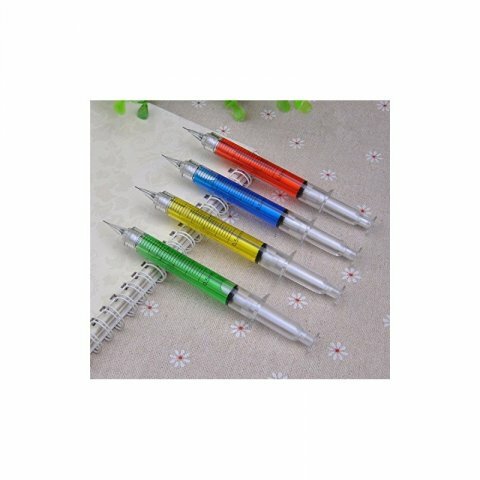 Consider these elegant looking pencils designed to look like syringes. Ideal for slighter older kids – the pencil has a clear plastic covering while inside there is a hollow tube, where colour liquid splashes around the pencil lead. The dimensions of the pen are 13 cm x 2 cm and they come in a variety of colours. You can order these for Rs. 20 per piece on birthdaypopper.com. 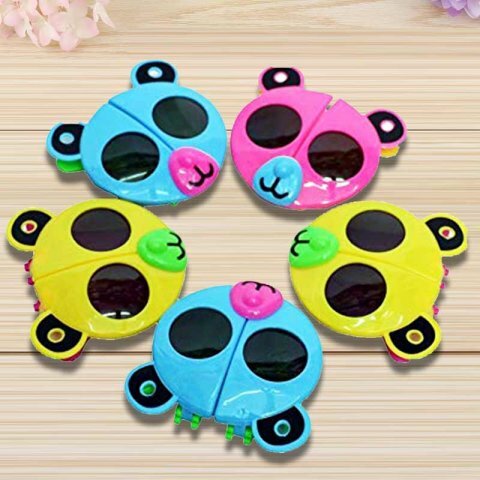 Other than pens and pencils, you can also gift kinds funky shaped sharpeners, erasers or even full sets. 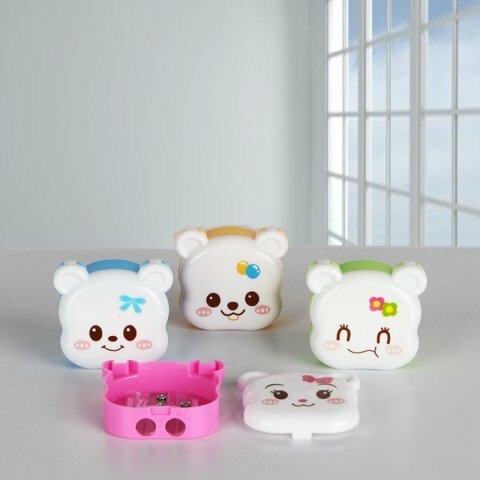 Take a look at these adorable teddy face sharpeners priced at just Rs. 15 per piece. They come with 2 sharpers so they remain useful for long, blue you get them in a range of colours. Available on smalltub.com. Sometimes the most basic of gifts makes sense. If that's what you prefer, then take a look at this plan and simple gift set that will be useful for little ones. This set comes with one Pencil, one Scale, one Eraser, and one Cartoon badge(randomly chosen character) that can be pinned onto bags. Buy it on smalltub.in for Rs. 18. Stickers are ever popular and the pride of a kids’ stationary collection. School-going children use these stickers on bags, geometry boxes, metal, paper and other items. Doraemon Stickers Strips Pack of 25 is a wonderful and highly cost-effective option. Available at a cost of Rs.125 for 25 strips on partyone.in, you pay only Rs.5 per strip. Each strip contains a total of 7 cute Dora stickers. Stickers in other themes are also available on the site at the same rate, and you can either combine each sticker strip with other goodies or give 4 strips to each kid as a wonderful return gift at a low price. Give a boost to kids’ creativity with a gift of watercolours. 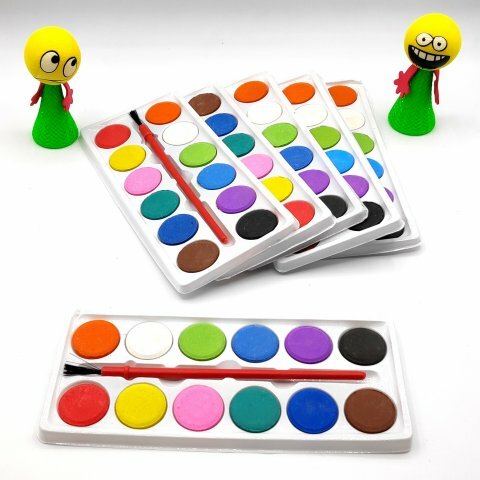 Here is a mini set of 12 watercolours and a brush that is sure to keep the little ones occupied making cute drawings. There are several options available across different sites but this set on giftoo.in is available for just Rs. 16. A cool gift that is sure to catch the fancy of young ones – a decorative stamp that comes with inbuilt ink. While the outer shell is made of good quality plastic, the stamp is made of rubber with dimensions being 2.5cm, height: 3.5cm. The product set has several different themes ranging from smiley emoticons, fruits/vegetables, farm animals, dinosaurs, and wild animals, but you may receive random ones as there is no option to choose specifically. The per piece is Rs. 11 on giftoo.in. For roughly around Rs. 20, you'll get 2 of them that you can add to a goody bag. Here is a gift idea that is not only useful but also does teaches the kids something. A gift that is truly different – plants from pencils! 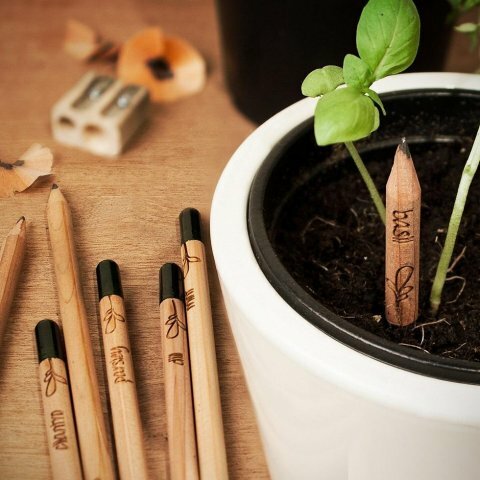 Yes, these pencils have seeds that can grow in actual plants. Once you finish the pencil, put the plant in pot, and see it blossom into a vegetable or flower plant. You can order these for Rs. 19 on giftoo.in. Kids will be intrigued by the opportunity to grow something on their own, and the gift provides parents with a fantastic way to teach them about plants and gardening. Gifts for older kids need some more thought as they look for stuff that is is more exciting. 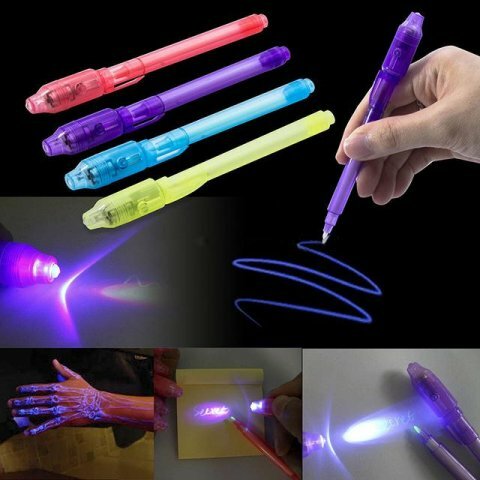 If you can add a few more rupees to your budget, then consider this really fun Magic pen with UV light. This “Spy Pen” features an invisible ink that cannot be seen by the eye unless you use the UV light available on the cap of the pen. Completely safe and non-toxic, this ink is washable and harmless to use. The pen can write on a variety of surfaces including wood, metal and plastic. It will be a thrilling experience for kids to experience the "magic" of the pen and learn about its working. Available for Rs. 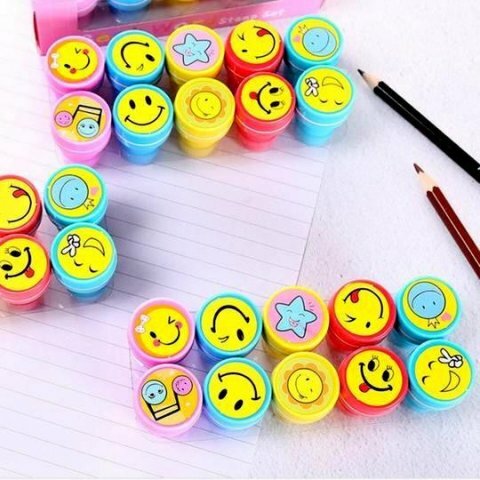 22 on giftoo.in, you get the pen in different colours like blue, green, pink, and orange. Finding return gifts for adults under Rs. 20 can be a tricky task indeed. Your choice may be restricted but we have scoured different sites to identify a few that is either within that budget or close to it. These items are useful for pujas, small gatherings or festive occasions. Are you holding a puja at home and want a small something to give as a return gift to people who attend? Then take a look at this simple acrylic haldi-kumkum box. Shaped like a kite, the box is clear and features a small rangoli design. Available on pujaprapacha.com, this no-frills gift idea costs Rs. 20 per piece and the minimum order quantity is 5. Ever thought about gifting candles? Believe us, guests will surely loves this unique gift, when you get them a designer candle for their home. Decorated with beautiful colours, specially designed to enhance the beauty of your home and living area. Since a candle spreads brightness around, gifting a designer candle can signify your intentions to pray for a happy and bright life for your guests. Set of 30 Hosley Fragranced Rose Tea Light Candles is a wonderful pack available in Flipkart. The wax-made tealights are 3.8 cm wide and 3.7 cm deep with rose fragrance infused in them. 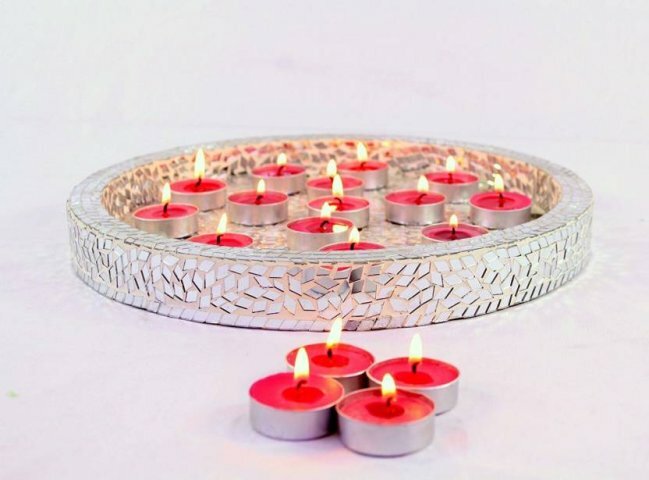 The round shaped candles have a lifetime of 3 years, and are available on Flipkart for Rs.210 only. This means, you can give each guest a pack of 3 candles as a return gift under or around Rs 20. A keychain or a key ring is also a good option as a gift. 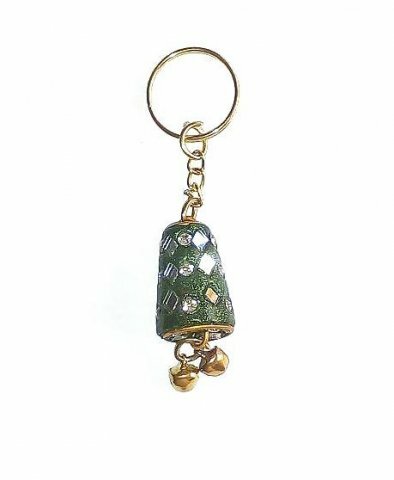 Small, but beautiful and useful, a keychain can be used with keys or bag. When considering a return gift ideas, a smiley keychain or the one with a meaningful message on it will always remind the receiver of you, cherishing the bond of your relationship. 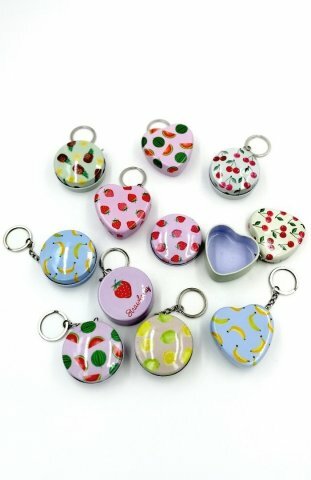 Give your guests these cute Fruit Prints Metal Box with Keychain. Made of metal, the keychains double as a small box to keep small things in such as mint and mouth fresheners. The boxes measure about 2 inches across and are printed all over. Guests can use the keyring to attach keys or to hook it to their bags as a cool accessory. 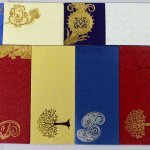 The boxes are priced at Rs.25 each on returngiftwala.com but inquire for bulk orders for over 40 pieces and you can get these on a lower price and give your guests a wonderful, small, and useful return gift within your budget. This gift too is slightly over the budget at Rs.24 but is well worth the price. Consider this elegant gold-hued kumkum box as a simple yet elegant gift option for your puja. 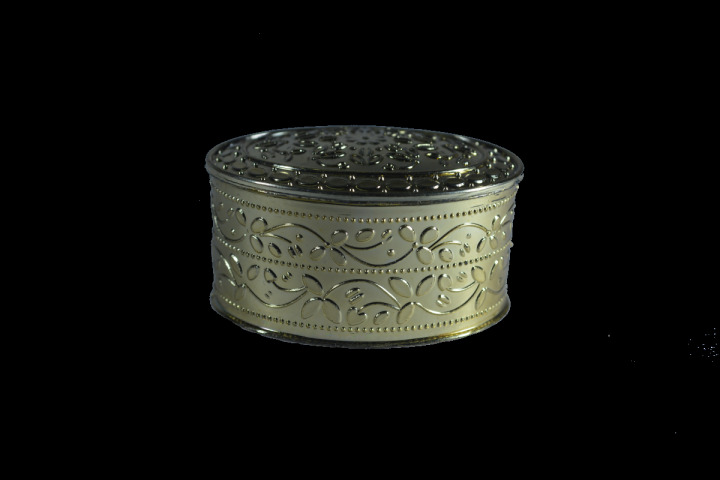 The box measure 2 inches in length and 1.5 inches in breadth, and has a floral design stamped all over. The minimum order quantity is 15 for this price, but the price drops in case of increasing order quantity, reaching Rs. 20 if you order 101 or more. 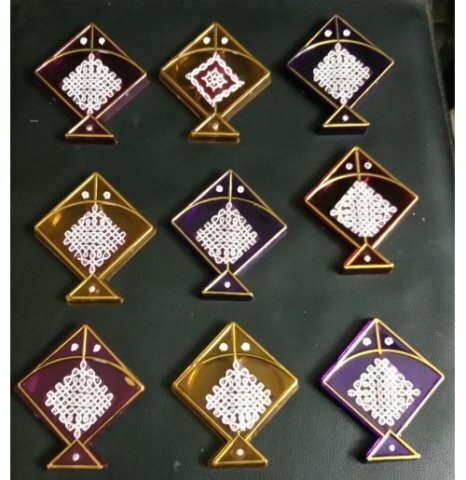 Check out this neat option on pujacelebrations.com. A return gift may cost as little as Rs.20 or several times that amount but what matters most is how it's given to guests. There are plenty of websites that cater to return gifts and you can get more than one gift even in a tiny budget. Wrap the gifts well or put them into nice looking gift bags, add supplementary gifts like candy and chocolate depending on the age group at the party, attach a small handwritten note and guests will be mighty pleased with your effort. It's not the price that matters but how you present small and cheap gifts.